In this case the survivor is the strangler fig and as you can see it has totally devoured the tree it has throttled. Looks like something out of a sci fi film. Who knew plants could be so vindictive. Hope the figs are good. Makes a nice pattern though ! Makes nice patterns on the dead trunk. Sad for the tree that lost the battle. We have a vine here called Kudzu, it is a constant battle to keep it at bay, as it kills trees too. What a shame that such a beautiful sight is the scene of the killer ! Good shot- poor tree! 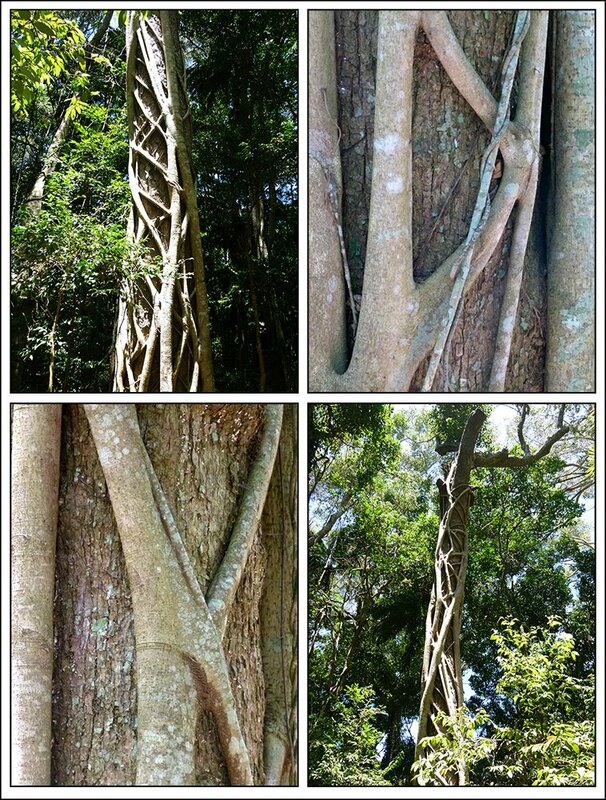 We have several vines that will do the same to trees around here- but they don't look as pretty as the strangler fig. Hope it`s not an Ivy. Great shot of the textures of the roots. Very nice collage! Love the way the limbs tangle together. Ah yes those strangler figs do tend to take over if given the chance! Wow that plant is strong. Great collage!